This recipe comes from my elder sister Abha. Gum or gond is a tree resin. Along with ginger, it is supposed improve lactation in nursing mothers. In north India, it is tradition to make it for a nursing mother. I remember my grandmother making it for my mother when my youngest brother was born. It is also made on Janamashtami, the birthday of God Krishna, I suppose in memory of His mother! As my children were born in UK, I missed out on it. 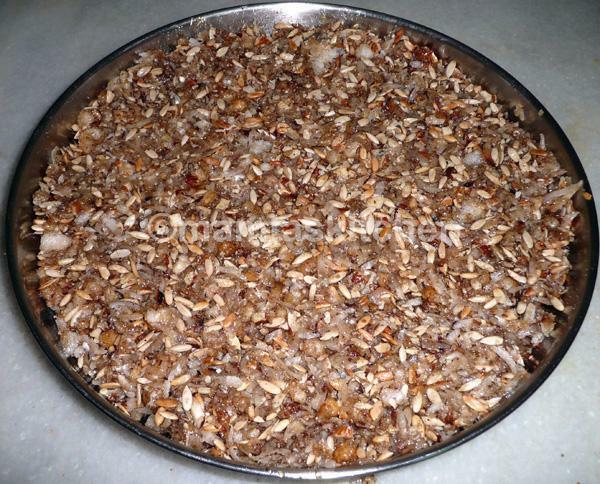 It has a lot of nuts, ghee and sugar, rather a high calorie food! Gum can be bought in the West from any good Indian grocer - Mamta"
A wire spatula or a fine slotted spatula, to lift gum out of the ghee. If you do not have this, a wire strainer can be used. Grease a flat tray or 'a thali'. Keep aside. Make sure that the gum resin is dry and not sticky. Coarsely grind it by placing it between 2 layers of a tea towel and gently pounding with a rolling pin or a meat tenderiser. It should be of a thick, granular consistency, not powdered. Heat a wok or karahi. Dry fry melon seeds and/or chironji nuts in a hot wok or karahi. Keep them covered, as they splutter and jump everywhere. You can do this in a microwave too. Dry fry the coconut on medium heat, until coconut aroma rises and it turns very lightly. Keep aside. Heat ghee now, making sure that the ghee is not too hot. Fry almonds until fried aroma rises. Dont burn/let them turn dark brown. Cool and chop roughly into small pieces. Keep aside. Gum burns very quickly, so make sure that remaining ghee is not too hot. Fry gum resin in small batches, on medium heat, stirring it up all the time, to ensure that every single piece is fried. It fluffs up to almost double the size very quickly, within seconds. Lift it out of the ghee quickly, as soon as it fluffs up. Otherwise, it will burn and get bitter. Keep aside to cool. Mix almonds/chironji nuts, coconut, gum resin, keep aside. Boil the water and add sugar. Continue boiling (see instructions below) and make syrup of one wire consistency. Add ginger powder and mix. Turn heat off. Add gum, nut mix and coconut mix to the syrup and stir quickly, because it sets fast, to mix everything well. Turn out on to the greased tray. Flatten with the back of the spoon. I do it with wetted fingers, but be careful not to burn yourself. Cut into square or diamond shapes using a sharp knife. Pizza cutter is good for this. Measure the sugar and water in a clean pan. There should be no fat in the pan or syrup may not set. Boil on medium heat. Stir initially to dissolve the sugar but you do not need to stir it all the time. If any scum forms on the top, add a spoon of milk to the syrup. This will help to precipitate the dirt which you can lift out with a tea strainer. There are two signs of 1 string consistency: (1) When you lift a spoon out of the boiling syrup, the syrup falls in drops. (2) When a drop is stretched between two fingers, it makes a single wire. You must make sure that this stage is reached. Otherwise, your burfi will not set. Don't boil it further once this stage is reached, or your burfi will set too hard.